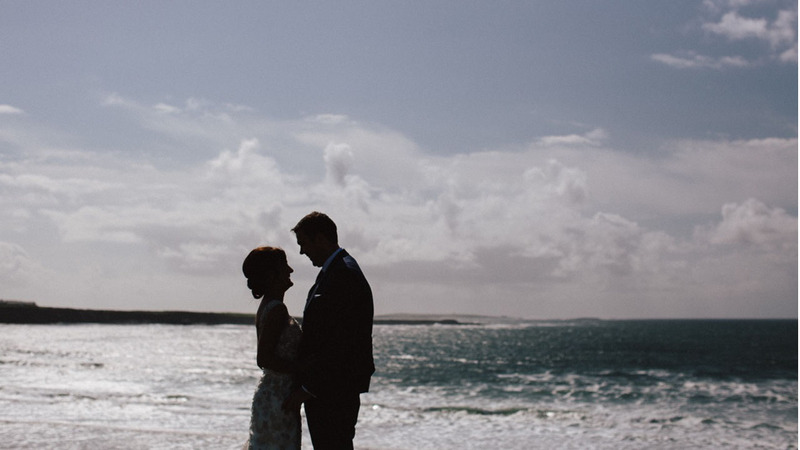 This was the stunning civil wedding ceremony of Alex & Mike which was on Hags Head at the Cliffs of Moher in Co Clare. The Hags Head is the name given to the most southerly point of the Cliffs of Moher in Ireland where cliffs form an unusual rock formation that resembles a woman's head looking out to sea. One legend relates how an old hag, Mal, fell in love with the Irish hero, Cú Chulainn and chased her would-be suitor across Ireland. Cú Chulainn escaped by hopping across sea stacks as if they were stepping stones. Mal, however, not being so nimble lost her footing and was dashed against the cliff. A tower stands at the Hag's Head, Moher Tower.